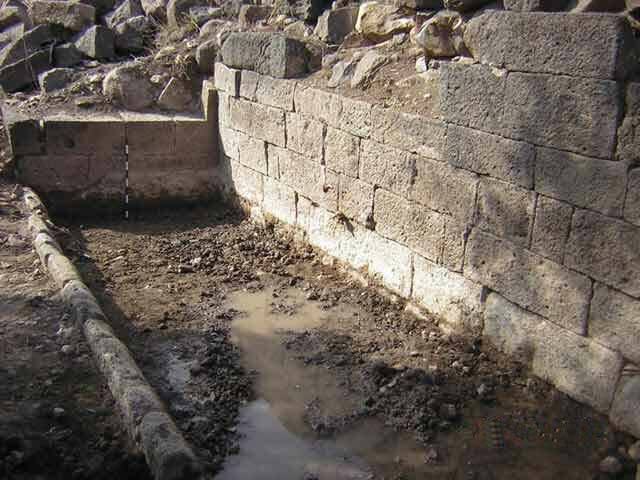 During June–November 2010, a trial excavation was conducted in the spring structure at the Deir ‘Aziz antiquities site in the Golan Heights (Permit No. A-5921; map ref. 266975/752150), in the wake of damage to antiquities caused during development work in 2007. The excavation, undertaken on behalf of the Israel Antiquities Authority and underwritten by the Golan Regional Council, was directed by O. Zingboym, with the assistance of Y. Ya‘aqobi (administration), M. Kahan (surveying and drafting), M. Hartal (guidance), H. Tahan-Rosen (pottery drawing) and Y. Gorin-Rosen (glass). Pupils from educational institutions in the Golan Heights participated in the excavation. 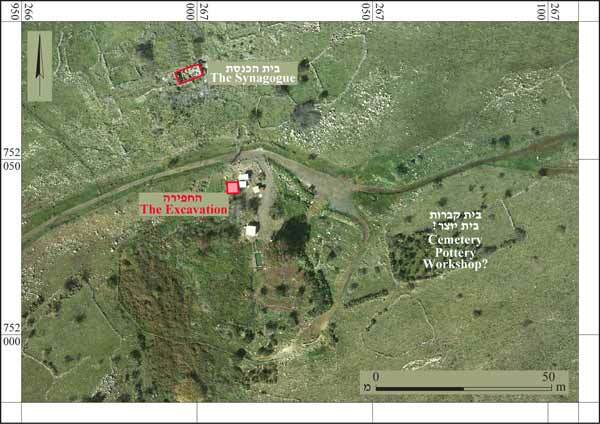 The Deir ‘Aziz site is located in the southern Golan Heights, c. 2 km east of Moshav Kanaf. The remains of the spring structure, which were massively built of ashlars, were exposed. The site is known from surveys of G. Schumacher and L. Oliphant in 1885. The site was also surveyed after 1967 (Epstein C. and Guttman S. 1972. The Survey in the Golan Heights. In M. Kochavi [ed. ], Judaea, Samaria and the Golan: Archaeological Survey in 1967–1968. Jerusalem, pp. 280–281 [Hebrew]). The surveys revealed that except for the Mamluk period, the site was inhabited from the Roman period until the modern era (Urman D. 1995. Ancient Synagogues: Historical Analysis and Archaeological Discovery. London-New York; Ma‘oz Z.U. Ancient Synagogues in the Golan: Art and Architecture. Qatzrin, pp. 149–153 [Hebrew]; Ben-David H. 2005. The Jewish Settlement in the Golan in the Roman and Byzantine Period in Light of the Finds of the Archaeological Survey in the Lower Golan. [Golan Studies 1]. Qatzrin, pp. 169–171 [Hebrew]). A synagogue, olive presses, cemetery and what may possibly be a pottery workshop were documented in the surveys of the site. During 1998–2004, several excavation seasons were conducted in the synagogue at the site and a unique basilica structure, an apse and a magnificent bema were uncovered. Six construction phases, dating from the sixth century CE until the modern era, were identified in the building (Ma‘oz Z.U. and Ben-David C. 2006. Innovations in the Golan—The Synagogue at Deir ‘Aziz. Qadmoniot 131:25–31 [Hebrew]). One square (3.3 × 7.0 m; Figs. 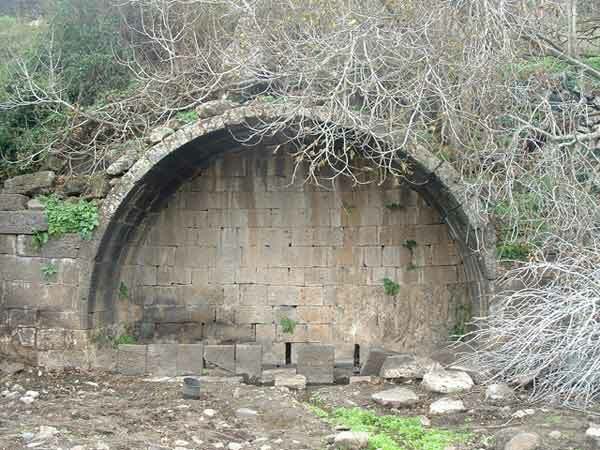 1, 2) was opened on a slope, just west of the Mē Golan building, and remains of a vault and a trough below it, built of basalt ashlars, were exposed. The vault was composed of a wall (width 7.5 m, max. preserved height 2 m; Figs. 3, 4) that was adjoined from both sides by piers, whose bottom parts were only preserved. A retaining wall of large fieldstones was built at the rear of the wall, to prevent its stones from rolling down the slope. 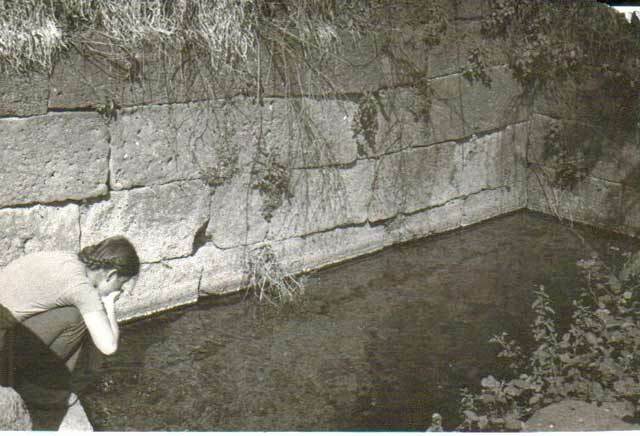 Spring water accumulated in the trough built beneath the vault (2.5 × 7.5 m). The trough was enclosed and paved with basalt slabs, which were coated with hydraulic plaster (Fig. 5). 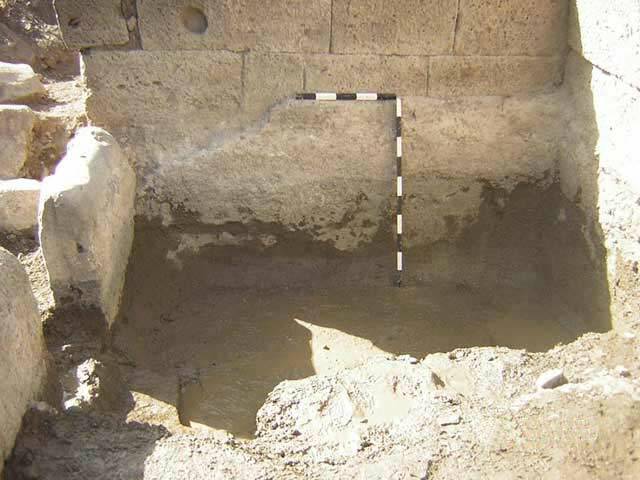 It was ascertained in the excavation that part of the trough shifted c. 8 cm to the south during an earthquake or landslide (Fig. 6). The structure probably collapsed in the earthquake that struck the region in 551 CE. 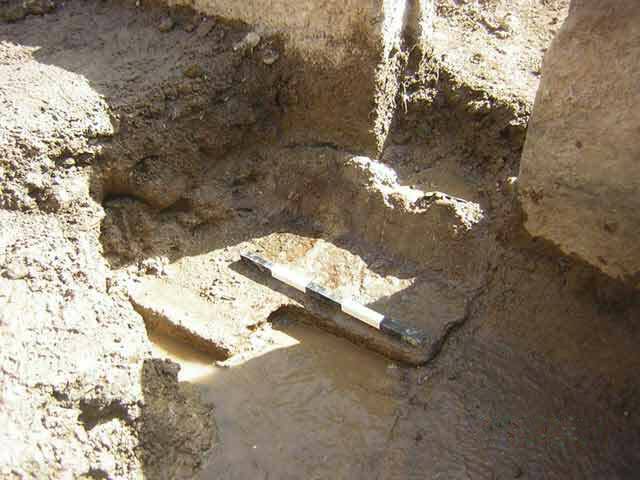 It was also determined that one of the slabs that enclosed the trough was missing, may be because this spot incorporated a pipe or channel that conveyed water to cultivation plots or possibly to the nearby pottery workshop. 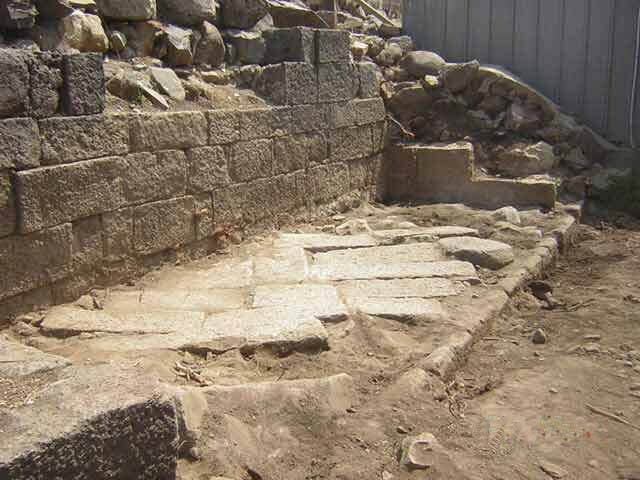 In a later phase, probably after an earthquake, the trough was sealed and a floor of stones, which were taken from the collapsed vault, was placed above it (Fig. 7). 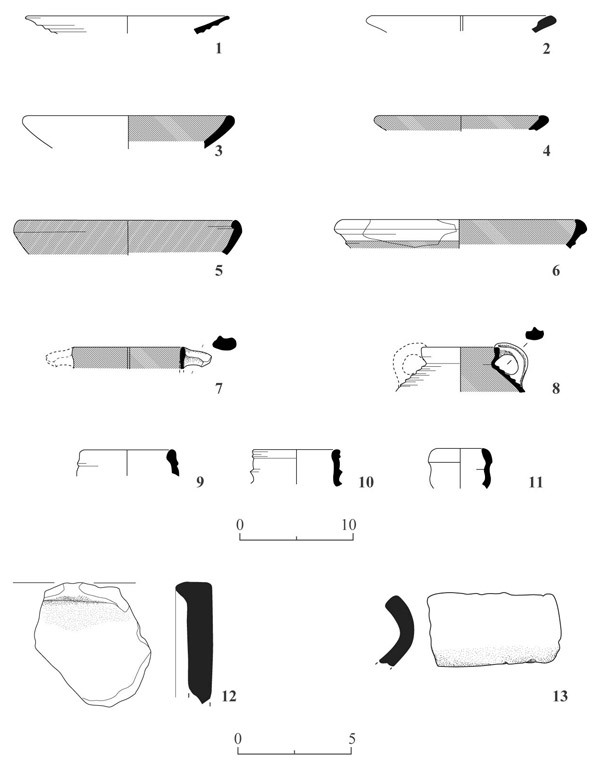 The excavation of the trough, below the level of the later stone pavement (L103), revealed numerous fragments of pottery vessels that dated until the mid-sixth century CE, including bowls (Fig. 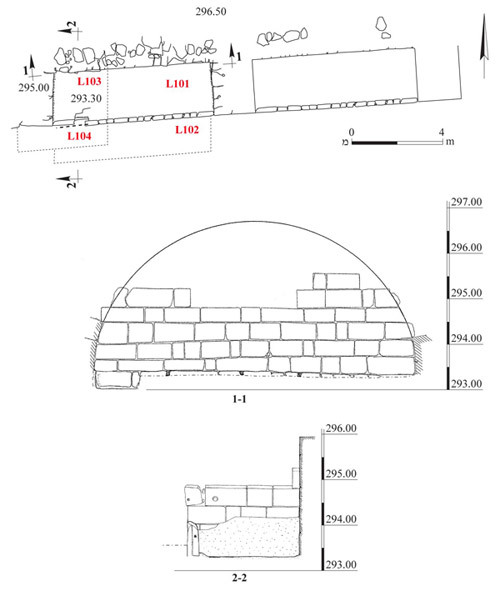 8:1–6), cooking vessels (Fig. 8:7, 8), jars (Fig. 8:9–11) and fragments of roof tiles (Fig. 8:12, 13). Based on the ceramic finds, the late floor is dated to the second half of the sixth century CE. It seems that the early phase of the floor should be dated to the second quarter of the sixth century CE and the late floor to the third quarter of the sixth century CE. The two building phases uncovered in the excavation may correspond to Phases 1 and 2 of the synagogue exposed at the site. Studying the data from the surveys and from photographs taken in the 1970s show that another vault with a trough below it (Figs. 9–11) was originally built east of the vault exposed in the current excavation. 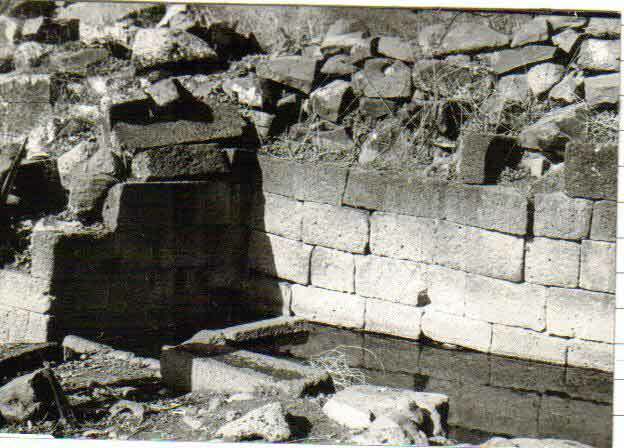 The eastern vault and the trough beneath it were destroyed and a small pumping pool of the Golan Heights Water Association was built on the base of the trough; it did not deviate from the dimensions of the trough, except for its eastern side. A pier (width 1.8 m) was erected between the two vaults; part of it was exposed in the excavation and another part is visible today in the pump building. Originally, the spring structure probably included another vault situated to the west of the excavated one; however, it has not yet been exposed. 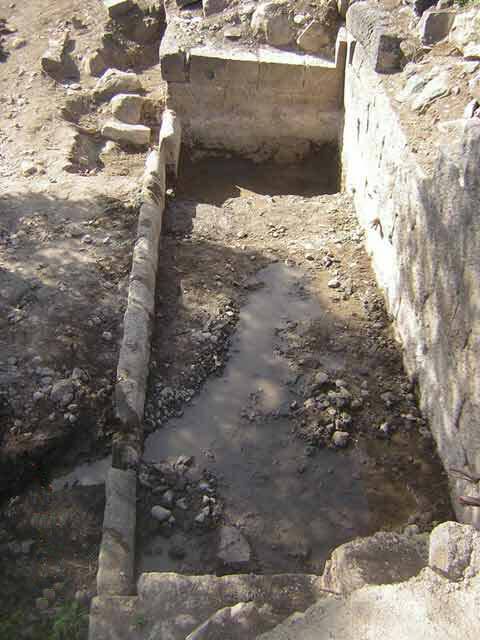 The spring structure exposed at the site resembles the one excavated at the Umm el-Qanatir site (Fig. 12), located c. 4 km to the east (Ben-David H, Gonen I. and Drey Y. 2007. Umm el-Kanatir. Qadmoniot 132:118–120 [Hebrew]). The spring structure at Umm el-Qanatir includes two vaults and a trough below each. It is possible that these two structures reflect a building tradition, practiced in the southern Golan Heights, where the basalt and limestone bedrocks meet. It is obvious that the construction of these massive buildings is expensive, takes time, and requires engineering knowledge and skill in hewing basalt. In both excavations the construction of the buildings was not dated; however, they were apparently used when the Jewish settlement at the site was present in the Byzantine period. In all likelihood, the two buildings were constructed in the first or second quarter of the sixth century CE. 1. Aerial view of the site. 3. The building remains, looking northwest. 4. The building remains, looking west. 5. The plastered trough, looking west. 6. The shift in the floor of the trough and its enclosure slabs to the south. 7. The later floor above the trough, looking east. 8. Pottery and roof tiles. 9. The eastern vault, looking west (photographed by S. Guttman c. 1970). 10. The eastern vault, looking east (photographed by S. Guttman c. 1970). 11. 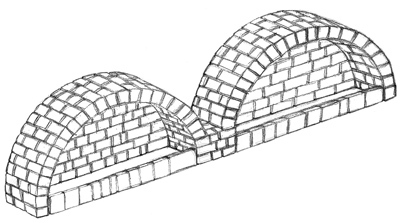 Reconstruction of the vaults. 12. The western vault in the spring structure at Umm el-Qanatir, looking southeast.